Simplify staff training and improve your falls prevention program with an all-in-one easy-to-use fall monitor that combines the industry’s leading monitoring features. The SafePresence® Fall Alert & Monitor is an effective, easy-to-use device that allows you to monitor persons who are at risk of falling and/or require assistance with mobility. The monitor uses a magnetic monitor cord attached to the device and person. If the person moves beyond the length of the monitor cord, the magnet disconnects from the magnet receptacle on the monitor and an alert will sound. 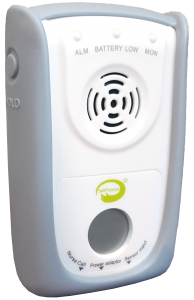 Other standard features of this next generation SafePresence® Fall Alert Monitor include monitoring support using bed or chair sensor pads, as well as the ability to pre-record a personalized voice alert. Our Falls Alert & Monitor works with most existing fall monitoring solutions.